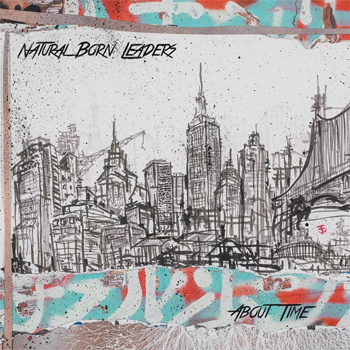 One of 2018’s most eagerly-anticipated Asheville, NC-related releases is the debut album from Natural Born Leaders. Even in an era of countless cross-genre mashups and hybrids, the music of Natural Born Leaders is difficult to describe, and it resists piegonholing. The group’s sound starts with a relatively conventional rock instrumental lineup: guitarist Rex Shafer, bassist James Eddington and drummer Kevin Murtha. Jazz and r&b textures are provided by saxophonist Ben Survant, while lead vocalist (and lyricist) Mike Martinez brings folk, soul and hip-hop flavors to the group. The “prog-hop” label is a useful a way of defining Natural Born Leaders’ music, and the group itself sometimes uses the term (along with many others) in its own promotional material. The four songs on About Time are a varied lot. “Do You Mind” starts off with a melodic brass line that conjures visions of Northern Africa; the supporting bass figure has its foundation in funk. When the whole band kicks in, there are elements of reggae, but they’re delivered in an ambitious, progressive rock style. And Martinez’s vocals alternate between sharply-crafted rap phrasing and soulful, melodic singing. 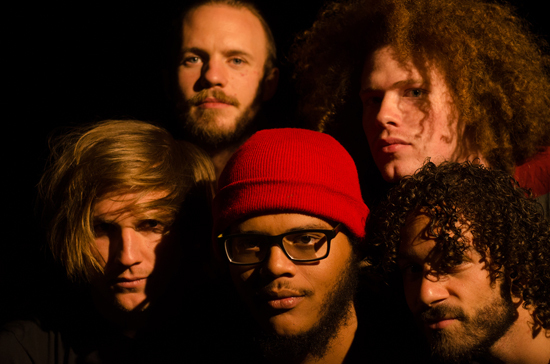 Natural Born Leaders’ music is dense and layered, and Martinez’s lyrics share those qualities. “I only write lyrics to songs that I absolutely vibe with,” he says. The lyrics to each of About Time‘s songs were written in one sitting. “Do You Mind?” “The Return of Jafar” and “’Time Flies By” all began as jams, he says. “I’ll blast a jam through my speakers at home, and write the lyrics quickly,” he says. An early lineup of Natural Born Leaders included MC Austin Haynes out front with Martinez. Having two MCs meant that the group’s music was more hip-hop oriented. But once Haynes left, Martinez’s folk-blues background revealed itself more in the group’s new material. And once the group entered Artcore Studios, producer Patrick Doyle helped Natural Born Leaders channel their jams into concise songs. Live onstage, Natural Born Leaders build upon the songs’ foundations, following their collective muse wherever it leads them. “I improvise lyrics a lot, too,” Martinez says. He half-jokes that he does so because he can’t remember his own words. “And a lot of time, I’ll freestyle rap. I’ll end up changing words around, putting this line here, moving something elsewhere.” So while About Time is an accurate audio document of Natural Born Leaders, it’s also a snapshot of the band in a given moment. “Every show is different,” Martinez says. There remains a relationship between the studio versions of the group’s songs and the way they’re played onstage. “I don’t like making songs I can’t play live,” says bassist Eddington. “But what’s fun is that when you work on a song in the studio, you end up changing it.” And then in concert, the songs change yet again. “There’s a give and take, a back and forth between the two,” he says.